Ham Radio on the Trail. Karen on top of the grape vine. Now that the event is over it seems distant. I have a hard time relating to the level of the fear we endured. The trip had been in planning for some months. I wanted to try out a new trail in the Kalmiopsis Wilderness. The garden and other matters conspired to keep me from taking the time for the trip. Then I caught a summer cold that lasted over eighteen days. A few days after the cold, most of the coughing had subsided. It was time to take the trip before the summer was officially over. My wife, Karen, took the time off work to accompany me on this hike. We had packed only dried food stuff, because of the extreme fire danger in late September. I usually cook with wood fuel in a home made stove but not at this time of the year. We were dropped off at the trail head, about 25 miles from home. This mountain, named Flat Top, is at the end of the roads leading into the wilderness. It was 8:00 a.m. Saturday and we had five days of great hiking and beautiful scenery ahead of us. We set out for the trail 1140. This is the path to York Butte. This new trail would take us to 1144. Trail 1144 will join with another we have been on often 1161. It was to be an easy way to go, so we were eager to get at it. I have to sit on the ground, and get into the pack. Rolling over onto my knees, I can then get up. I was sore and my legs were weak. "I will walk it off. It will be fine." It always feels extra heavy at first it will be OK. Down the trail we went for about an hour. We had missed our trail 1144. Something was wrong. Back tracking, we went up hill for about 20 minutes. Checked the map, looked at the trail and the mountains. Unpacked the GPS and took a reading. "Well it should be here!" Circled about and looked for the trail for over 30 minutes. The pack I carried was about 55 lbs. and Karen had 45 lbs., it was important not to make mistakes of up and down and round and round. By 10:30 a.m. I knew that we were not going to find this trail. Back we went the way we came, up hill now of course to get to another trail to take us to the same place. It was going to be about three or four miles to get back to the start of this hike. We could see where it was we wanted to go. "Just over there a bit, so why not bush whack right to it, and not go all the way around? So if we cut over there we can drop off through that clear spot and get back on the trail we want!" OK we are off again. The clear spot was not clear, it just looked clear from a distance. The brush was about six to seven feet high, a thick tangled mess. We back tracked again until we could find a way down and around. We finally did, and now we are at the start of our hike. It was now close to noon and we had spent over four hours stomping around in a circle. About an hour into this part of the trail, we are lead down the head waters of Silver Creek. We see a mountain called Chinaman Hat straight ahead, then to our left, then to our right. It is quite odd how the mountain seems to move. This mountain stands all by itself, and is very pointed. At last about two hours later we are on 1161 proper, the foliage is lush here. Tall grasses and ferns, lots of berries, this is the trail to Bald Mountain Spring. We now are pressed to go a bit harder. We have a very difficult lift to make now, and about five more hours of hard hiking will accomplish it. This part of the trail 1161 is very steep. For hundreds of yards on loose stones it slopes about 45 degrees. It is a hard climb and harder in the high heat of the day. It was as expected and we used two walking sticks each to keep our balance. With some rest stops, determination, we made the worst of the climb in an hour and half. It is an 800-foot lift in close to half a mile. Now we are off for a three- hour trek on a very good trail. When we get to the spring, we will make camp. Bald Mountain Spring is a great spot. About 4000 ft this mountain has many ferns and big trees. There is lots of water. The animals are everywhere. We set up camp. Set up the radio station. We are Ham Radio operators and take a home made low power radio to talk to our friends with Morse code. About the time I was talking with my friend, Bill, 30 or so elk decided to come up toward camp. Our young Australian Sheep dog, Josephine was with us. She alerted us with low ruffs that were barely audible. I put the dog in the tent. Karen sat with her back to a big tree and watched the show. I continued giving an account of the "Ruffs" and "Oh My" to Bill with the taps of Morse code. The Elk were a delight for Karen, she had never been within 100 feet to a herd of wild animals before, it was fun to watch. We ate our cold camp dinner and waited eagerly for darkness and bed. The night passed with but one event that is worth note. A large deer dug a series of holes in the hill side to eat something. Shining the light on her did not seem to bother her at all, she continued to dig and eat. I went back to sleep. The next morning we missed the hot coffee but we got through it OK. We picked every thing up. Got all the gear packed up. When all was just right, about 8:30 a.m. we started to hike. We were going to Polar Spring, by way of some wonderful Prairies, meadows and steep hills. Fortunately the trail took the ridge line to get to the spring. We saw lovely flowers and great vistas and lots of quiet. Now about 40 miles from any civilization, it was very quiet. About two and half hours we made Polar Spring. Here we took a rest and looked over the maps. This new trail 1189, we wanted to try. It goes south down the ridge to South Bend Mountain. Midway it will join another trail 1174.1. This trail drops off into "Colliers Bar" on the Illinois River. Colliers Bar was the place we wanted to investigate. After a bit we were off again. The trail marker is the typical wooden sign with routed numbers. Up hill across many dead fall and hill top flats that let the trail fade into near oblivion. However with some reading of the path in the deep pine needles we came out on a ridge that was spectacular. Hiking about an hour down this ridge, we will come to a saddle and 1174.1. The trail here is the ridge. It is in many places less than three feet wide. Stair-stepping down the ridge. The mountain falls off to the right and left for a mile or so in each direction. Gives one the feeling of being in the Alps. Great views. The vultures sitting on the snags on the ridge-line with wings outstretched is a sight. When we got to the saddle, there were no markers. There was a beaten path. It was looking more like an Elk path than a real trail. I looked at the topo maps and pulled the GPS out and took a reading. We could only be in the correct place. The ridge was quite sharp and the ground dropped off on both sides, so there was no denying we were on the ridge. The saddle was deep and shot right back up so we were in the saddle. Our problem was that the trail, was not here. We did not like the idea of back tracking the way we came. It would be up hill and quite steep for more than four or five hours. We thought we would try this trail and see. We did, and in about 200-300 yards down the hill the trail disappeared. I knew now we were in some trouble. I thought if we cut the mountain on a line to the left we should cross the trail again. So we were off down the hill. Bush whacking that is. This country falls 3000 ft in a little over two miles. The hills here are covered with oaks and Madrone trees, some maple and tall brush. We picked our way down and over, step by step. The ground fell away at an alarming decline. We took to the center of the ridge sloping down but staying on the high spot in the roll. It got steeper still. Karen lost her balance and fell a few times. Now I started to worry about getting to our next camp that night. The time was one or two in the afternoon and I felt if we got lucky we could get down off this mountain and make camp by dark. Wrong. We worked our way down the hill and ran into a very steep piece of ground and decided to drop off to our right down into a small creek. This creek, or slot canyon, had great rocks in it. Some of them were 30 to 40 feet square. This jumble fell down in stair steps. We went into this creek and made our way down several steps with a great deal of difficulty. We had to lower our packs and then each other again and again. Hard work for someone not really well yet. Then we came to the first of the water falls. It was almost one hundred feet to the bottom. As I stood in the middle of the stream, I could look out over the treetops. I knew now that things were going to deteriorate in a hurry. I took my pack off. Worked my way down to the spill way, and looked over, it was a long way down. I then concentrated on what I could see about the canyon on either side. To the south was steep face that raised five to six hundred feet. Looking to the north it was not much better, only it swooped out to the west and rolled off. We would have to angle up and out of the canyon to get onto the roll, to go west and down hill. First we must go up the canyon side wall and make enough altitude. This was very hard for Karen. Digging the sides of her boots into the soil on the slope was difficult. Her ankles seem to lack the strength to dig in. We made it with many trials. Now we were on the top of a ridge again. I began to tell Karen where we were in relationship to where it was we wanted to go. Showing her the lay of the land, I compared it to the map. Then I showed her where I thought we were on the map. Next I got out the GPS and took a reading to prove to her I was right. Also, I needed the reassurance for myself. I have spent my whole life in the woods, and have never been lost. I was not lost then but I was not on the trail that was on the map either. That degraded my confidence. We made some progress. This progress came to a halt. The ridge we were on, came to an abrupt end, in the shape of a cliff several hundred feet high. We then picked our way off to the side, and moved to the north. Sitting and sliding in the more difficult spots. It was so steep in there that we slid often for more that several hundred feet at a time. The ground was covered with decomposed rock and oak leaves and sticks and twigs. By picking the slope of the ground and spots between the trees, we slid on a rolling blanket of debris being churned up by our legs. We went at a good clip at that. We then again ran out of ground that we could slid or walk on. It was very steep. I decided to drop off into another slot canyon to the north of the last one and see if it was passable. Down the canyon we went to the sum of two or three hundred feet. The rock was only eight to ten feet squarish in shape and sharp edged, they were wet and covered with moss and slime. It was very dangerous and very difficult. Karen now near exhaustion and despair. She was holding up well under the circumstances. I could see we were now running out of light. When I checked my watch I was astonished to see it was almost 5:00 p.m.. I could not believe we had spent over five hours struggling to cover so little distance. We needed to make camp and rest. This canyon was wet and cold, definitely not the place. There was no space large enough for a sleeping bag. Spending the night in this cold place, this tired, sleeping standing up was not going to happen. I could see the sky through the tree tops off to the north. I then decided to see if we could get back up on a ridge roll. I took my pack with me. Karen stayed in the canyon. Listening to a hand held radio, she tracked my progress. It was extremely steep. Near vertical. I was very tired and concerned for Karen. For if something happened to me, she would be by herself in the middle of this wilderness. I had to get up this cliff and find a camp site soon because darkness was coming fast. I picked my way up and then up some more. It was solid rock for 50 feet, then some loose decomposed rock that scared me silly. I could not get traction here. I found a downed tree and clawed my way up it to get past the decomposed rock. It took nearly 45 minutes to make the climb and that with 55 lbs. on my back. It took its toll on me. My legs began to cramp. The tops and bottoms of my thighs were knotted. It was very painful. I drank some water and in about ten minutes it passed. I found a spot, it was not the best but the light was fading fast now. Got out of my pack. I took everything out of my pants pockets I needed to lighten my load and now ounces counted. I called Karen on the radio and told her I was beat. She said she would stay in the canyon. I said I would be there soon. I took the marking tape we carry and flash light and went back over the cliff. Going down is so much easier than up when you are that tired. I was aware of making a mistake here. Carefully I made my way back down. I marked the path I was taking with the Bright Blue tape. I called to Karen from time to time and finally got to her. Getting into her pack, I told her she had to make this lift on her own. I could barely take her pack of 45 lbs. for a second trip up the cliff. So up we went, she did just fine. The dog had made two trips up the cliff. I had a great deal of difficulty. Seeing the Blue tape in the low light was impossible. I will change the tape to White or Yellow. Now it was almost totally dark. the summer air was warm, so no tent. I was in the process of getting my gear undone when I heard a noise. "What was that?" I asked. "What was what" she said. I said "it sounded like, Wish wish wish." She said she did not hear it. I went back to work but knew I had heard something. In a few minutes she said "Do you have my sleeping bag?" No. I got the flash light and looked around the camp. She said "it was just here." Then I remembered the wish wish wish. I looked in the down hill direction from camp. We were on a ridge and the way we came was some hundred feet away but I had not investigated in any direction other than the way we came. I looked to the west and the ground fell away. We were on a finger of ground that stuck out into the darkness. It was like a peninsula with cliffs to three sides. I found the sleeping bag. I could see it now. It was over the cliff down about 30 feet resting in a tree top. Karen said she would sleep on the ground. I said right "you will sleep in my bag and I will sleep on the ground." So I got the rope. Tied off to a tree and over the cliff I went. I could not see the bottom of the cliff in the dark. That was a good thing. Hanging with the flash light in my mouth, I got the bag and tied it to a line. I had to tie with one hand while holding on with the other, light in mouth. Back up the cliff, a rope sure helps. Pulled the bag up and all is well. I drank some water. I was very tired. I was not hungry. We got into the bags and went to sleep. It felt good to lie down. Nice stars. Warm temperature. The dog was sleeping at out head. We all were awakened by crashing and bashing. The dog moved to get between us. "Thanks" I said. We went back to sleep. It was good. The next morning we were in better spirits and a whole lot fresher. We ate and packed up the gear. When we had climbed some, we could see where we had been. You know the movie "Bambi," where the stag is outlined on a skyline bluff that juts out into the canyon? That is the place we spent the night. We worked our way back up hill to get to a place to start to head down again. We were a day behind schedule and missed making radio contact the preceding night. Hoping to make the trail to Colliers Bar today we moved on. The ridges were the only place to navigate. The sides of the ridges were so steep you could not walk on the side hill easily. We hiked and slid, we went down and then the ridge we were on became a cliff. It was like someone took a scoop out of the mountain and the ridge we were on was dead center of this scoop. It was beautiful and horrible, all at once. We had to drop off the north side of the roll as best we could, sliding till we ended in another Slot canyon. This one was short lived however. Only two or three hundred yards long it came to a beautiful 100-foot water fall. Karen was crushed. I dropped my pack and told her to keep the dog with her and she did. I found that if we went out to the spillway and climbed to the right of the face we could get to a place we might slide again. Back I went and kicked a path in the decomposing rock. This was a very tight spot. The cliff here is covered with a whitish decomposed rock. This was very lose and powdery. It also was very steep 75 to 80 degrees. I was afraid Karen could not balance herself on the path I had made. The packs rubbed the cliff wall if you turned to face the path. Facing the cliff, you could become off balanced easily. I got my pack and took it to the end of the path I had made. Getting out of my pack I secured it to a tree. I went back and got Karen's pack. She followed. At the end of this path I had made, We stood face to face on a cliff. She had here back to the cliff and I had her pack. I put her pack on her and had her sit with her back to the cliff and feet up against a small tree. I put my pack on and told her to watch because I was only going to get to do it once and she needed to follow. I worked my way further to the right in this loose material till I could see all the way down to the bottom, a clear run. I sat and slid. I mean slid 200 to 300 feet in cloud of white dust. Karen was next. She made it out and over OK but when she started her slide she veered some to the left and got very close to the cliff again. She leaned back and stopped and moved over for another tack and made it down. We spent little time congratulating ourselves on these successes because we had so much more to do. We had gone down for another quarter of an hour or so and there was another piece of ground that was steep and clear of trees so we slid down it as well. Half way down this I could see that some thing had dug a large hole in the hillside and it was right in line with my path. One thing you cannot do very well sliding down the mountain and that is move left or right. I only had a few seconds to formulate some thoughts on this hole. It must be a badger hole I thought. I decided that I would spread my legs and plow up dirt and fill in the hole as I pass over the top of it. Good plan. When I had passed it by ten feet or so, is when I started to get stung. Bees I yelled to Karen. "Stop" I yelled. The dog was now trying to climb on me she had a cloud of bees about her. I beat on her with my hat. I beat on me with my hat. Running and beating the air, I got away. Karen still on the hill was not sure of what to do. I got her to move further to the left of the hole and told slide till she could stand and then run. She did. I watched in disbelief as she moved in slow motion. I yelled "RUN!" She swears she was running and I swear she was hardly moving. This being the difference between Adrenalin and fear, I guess. She was never stung. I was stung about six or seven times. We looked at the hills and the map again and picked a line that should cross the river trail. We were down on some rolling ground that let us move with some ease. In about 30 minutes we crossed a path that appeared to be a trail. We took this north and finally got to Colliers Bar. We were happy to be at place where the trail signs are marked. We were now about three to four hours away from Silver Creek the place we were to spend the night. This was my first time to Colliers Bar. The trail signs on the trees were the wooden routed number signs that are arrows that point a direction of the trail. I looked at them and realized I did not like what I saw. They seem to point the wrong way. The numbers were correct but they seem to point the wrong way. I got the map out. Now I have to tell Karen. Yes we are on the trail but the signs are wrong. I did not think after 24 hours of bush whacking she would believe me. I showed her what was wrong and why I thought we needed to go this way rather than that way. She said "OK."
We set out for Silver Creek about noon. We hiked the Illinois River Trail 1182 from Colliers Bar to Silver Creek in about three and a half hours. Karen was jubilant that we were on a trail, a freeway. I was delighted to find the Blue Berries and Salal Berries were ripe. We walked an easy pace and ate and ate and marveled at the abundance of the berries. Our hands and mouths were blue. When we got to Silver Creek, it was about 3:30 p.m.. We set up camp. Took a bath in the river and enjoyed the sun and air. Karen was ecstatic that we were someplace she knew how to get home from. We had a pleasant afternoon to talk about the preceding 24 hours. I set the radio station up for the evening talk will Bill. We washed clothes. Life was good. The next day we climbed up what they call "The grape vine." It goes from 347 ft in elevation to 2400 feet. This accomplished in less than half a mile in distance moved on the map. By way of some 13 or 14 switch backs it climbs. It takes about an hour. Then the remainder of the day is spent in going the rest of the way to 3800 feet, by Polar Spring again and on to Bald Mountain Spring. 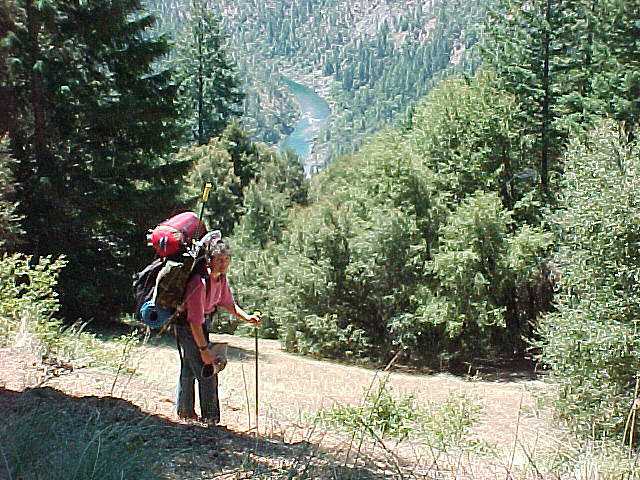 It is a wonderful hike, and it passes through many changes in terrain and in foliage. About Six hours at a steady walk brings us to Bald Mountain Spring. Camp here is wonderful in the big trees. We set camp. And rested. The next morning brings us to our last day. We broke camp and set our sites on the trip by Chinaman Hat. The Salal berries here are large. We ate Raspberries as well. I never eat all that is on a bush. Just some. There were so many, some here, oh umm, some here, oh umm. This is one of my favorite parts of the hike. We traveled easily knowing in five hours or so we would be at the pick up spot. It was hard to believe that we have been on the trail now for five days. Over 24 hours of which was spent off the trail bush whacking through country few have seen. It was a very good time. The day went smoothly. The vistas are always breathtaking. Some weeks later I called the District Ranger. He told me I needed wilderness skills if I wanted to go into the wilderness. That I should know how to read a map and compass. I told him about the trails 1144 and 1174.1 that had vaporized and about the error on the numbers at Colliers bar. He said the trails had been abandoned and he would check on the numbers. This winter I practice my wilderness skills, read my maps and dream of summer.